New York Power of Attorney Forms provides different ways for an individual to give another the right to represent him or her in a variety of matters. There are different occasions that call for the use of a POA, so there are different forms. Some forms allow an individual to appoint someone with the authority to act on a broad range of financial transactions. Others are more limited and relate to specific events or transactions, while others relate to children and health care. In all these situations, the individual conferring this right or principal power will need to make every effort to choose a reliable and trustworthy agent, have a clear idea of what types of principal power should be granted, and when such authority should go in effect. 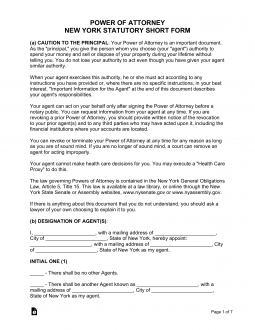 These templates will be versatile enough to handle most, if not all, situations where a principal will grant an agent Power and comply with Article 5, Title 15 of the New York Statutes. Durable Power of Attorney – Allows a principal to confer the power to act across a broad range of financial matters. It basically allows someone to act on your behalf with regard to all of your financial affairs. This type of form stays in effect even if you become mentally incapacitated and unable to act for yourself. Signing Requirements (GOB § 5-1501B): Notary public or other authorized official in accordance with RPP § 298. General Power of Attorney – Used similarly to the durable power of attorney. It also grants broad financial powers over a person’s financial affairs, but the difference is that it automatically terminates upon the incapacity of the creator of the POA. Limited Power of Attorney – This type is for limited transactions and circumstances. Usually, it is used if the principal is going to be for a temporary period of time when a transaction, like a closing, is supposed to take place. This allows the closing to proceed by having a proxy act in the principal’s place. Medical Power of Attorney (Health Care Proxy) – This form is also limited, in that it is only used in healthcare situations. The principal appoints a friend or relative who they trust to follow their health care wishes when they are unable to act or communicate for themselves and who they think knows them well enough to act as they would act if they were able to make the decisions. Minor Child Power of Attorney – This form is used by parents when they anticipate being away from their children for a period of time and they want their child’s caretaker to have the ability to make decisions on behalf of their children in the event the parents can’t be reached. Revocation of Power of Attorney – This form is used when a principal desires to have an existing POA terminated. It is important that in addition to filling out this form that you provide copies of it to your agent and others who may be relying on the original POA. Signing Requirements (GOB § 5-1511): Not mentioned; notary public is recommended. Real Estate Power of Attorney – For the use of an individual seeking to hand over their rights in relation to real property that they own. The owner may also make decisions in reference to the property but the agent selected will also have the same powers even if the principal should become incapacitated. Tax Power of Attorney – This form is used to appoint a tax professional in order to allow them to act on your behalf with the New York state tax authority. Signing Requirements: Notary public OR two (2) witnesses. Vehicle Power of Attorney – In the event that you want to have someone represent your interests in front of the motor vehicle authority in New York with regard to titling and registering a vehicle, you can use this form.